The bridge above is that at Lee Drove, completed in 1865, as seen on 5th February 2011, and scheduled for superstructure replacement between September 2011 and June 2013 to meet the W10 loading gauge for larger container traffic. The Test Valley Planning website can now be queried to see the project documents for all bridges and planned changes between Basingstoke - Laverstock - Redbridge, unfortunately its not possible to link directly to the documents at TVBC, but here is one at Network Rail showing some changes in plan for each bridge on the route. Between Romsey and Redbridge only the bridges at Ashfield, Lee Drove and Belvers (traffic lights bridge between Redbridge and Nursling) will now have superstructure replacment. Parapets will be 1.5m high, potentially impeding photography for shorter people, but the Coldharbour Lane bridge at Lee and the Spaniards Lane (Four Lanes) bridge will not be changed. Station canopies at Dean and Romsey are also to be altered. 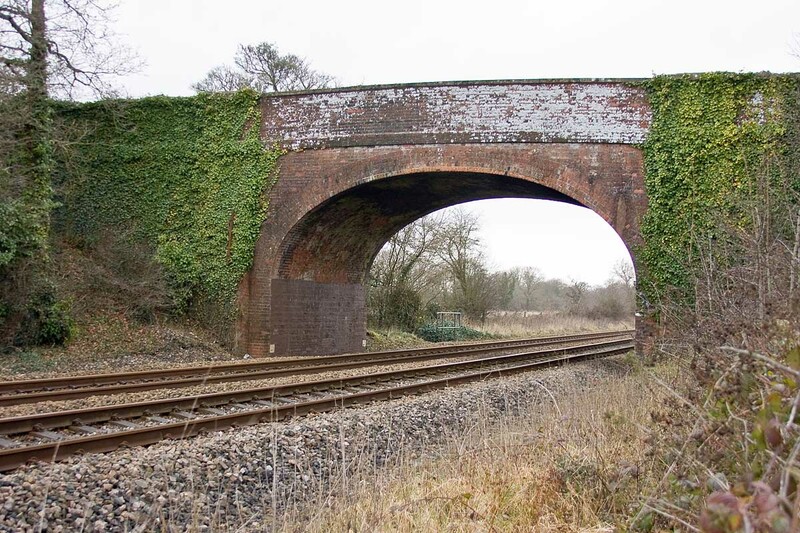 Update: The Wiltshire Council Planning website allows linking - here is the file for the New Road Bridge at East Grimstead, which was used for 29th January photographs below.